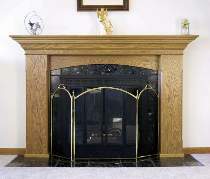 This plan shows how to make a fireplace surround with mantle. Perfect for many firebox installations. Includes simple techniques, suggested woods and instructions on which router bits to use to produce the look you want to achieve. Plan can be adapted for any mantle length.